Main building is finished, second building expected to open in December. Wide-eyed freshmen looking around in awe, gave James A. Garfield High School Principal Jose Huerta a great sense of pride on the first day of school, and Huerta’s eyes were almost tearing up, he confesses, as he saw students walking by the structural glass walls lining hallways of the new high school building for the first time on Tuesday. Huerta says the caliber of the building, the state of the art technology inside and even basics like air conditioning—which many schools take for granted—have been a long time coming for the Bulldogs. Garfield students and staff dealt with construction and portables for two years while construction was underway to replace two of the campuses main buildings: the administrative building with classrooms and the auditorium. 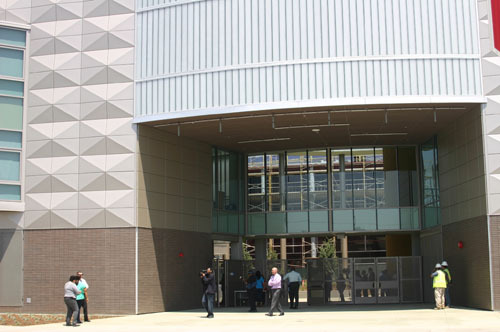 An arson fire in 2007 leveled the school’s auditorium and damaged the attached administration building, both were demolished and construction began in 2011, with the Los Angeles Unified School District later suing its property insurers for several million to reconstruct the auditorium. While the new three-story administrative building, which is the main entrance to the campus, is complete, construction of the1,400-seat auditorium and a plaza paying homage to famed former Garfield calculus teacher Jaime Escalante is still underway. Escalante, immortalized in the movie “Stand and Deliver,” passed away in 2010. Former LAUSD School Board member David Tokofsky, who represented School District Five at the time of the fire, was present for the first day of school campus visit with other school officials and special guests. Tokofsky recalled the tragic fire that night and how the late Bill Orozco, a community activist, was the first to call him and others at 5:30a.m. when he learned the building was in flames. “He was better than the fire alarm system here,” Tokofsky said kindly of Orozco, a former member of the EGP family. Superintendent John Deasy said the construction, totaling about $41.5 million, was absolutely a good investment. “The youth [of East LA] deserve nothing less. This is a remarkable opportunity,” Deasy told EGP. 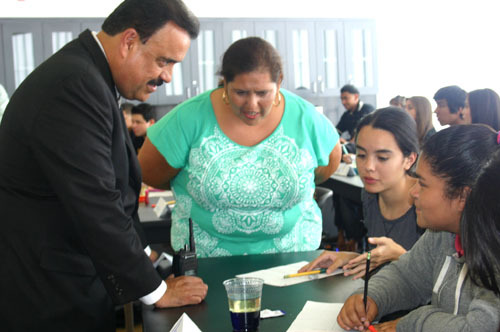 “I’m satisfied—I got to visit AP Calculus, AP Spanish classes, freshmen taking biology. Everybody was focused and everybody was doing rigorous work,” he said about his visit. On the exterior, the building looks like a monolithic and massive square with two tiers of angled windows flanking the front of the building, but the other side of the building has a curved, semi-circle shape with a courtyard and columns. The courtyard will lead to the auditorium that is still under construction. Maria Brenes, InnerCity Struggle executive director, said the campus has a college feel and will be a “game changer” for Garfield. “I think it sets the bar high for all of us to support the students. I don’t think we have any more excuses for students not achieving success, we should expect all students to graduate and be prepared for college—and if they chose to go, great. They have the preparation and skills to do it,” Brenes said. Brenes said the new high school building could also have ripples in the community and change perceptions. “I mean Garfield is a symbol of success and hope,” she said. She also commended Principal Huerta and the teachers for implementing a new program approved under the Public School Choice reform a few years ago. Garfield is also one of few LAUSD schools that have opened on-site health clinics with the goal of addressing underlying health issues that could cause students to miss school. The Garfield “Wellness Center” that opened late last year, is available to students and community members. The center is managed by Bienvenidos Children’s Center. The new administrative building houses 12 classrooms for students in different grades and from different small learning communities. About 70 percent of the students come from Career & Performing Arts Academy because they were previously housed in bungalows, Huerta said. Construction on the auditorium is expected to be completed around December or January with a community celebration and official ribbon-cutting ceremony planned for the first quarter of 2014. August 15, 2013 Copyright © 2012 Eastern Group Publications, Inc.